Last week, I returned from 7 days in Kansas City where 650 of my closest friends and I successfully completed the “Million Question Challenge”. This year, over 170,000 students took part in the AP Stats exam. With each exam having 6 questions, this was the first year the readers had the million-question task. In the evenings, there are lots of great learning and networking opportunities for teachers. One of the highlights is “Best Practices” night, where this year 17 teachers shared their classroom action. I presented my ideas and experiences with co-teaching in AP courses beyond stats (which I have featured on the blog before): what a fun and intimidating experience to present in front of so many people whose work I admire! My slides, below, outline my experiences working with teachers an AP Psych and Chemistry, and some examples problems from Biology. Kevin DiVizia’s “Scatterbrained Fathom”: to collect data to later use as an opening to the meaning of r-squared in scatterplots, Kevin takes his classes down to his football stadium’s turf field, “the world’s biggest ruler”, and has students launch stomp rockets. A very cool data collection idea. Does vertical height or participant weight make a difference ? If the reaction of the room is any indication, the Stomp Rocket people will have many new customers this coming year! Robin Lock – StatsKey. This free online site has pre-loaded data you can use to explore topics from the AP Stats curriculum. I enjoy the sampling distributions area, where samples can be drawn repeatedly from a large population and their means analyzed. Check out this sampling distribution of samples of size 30 from 2011 movie budgets, a population which is skewed right. Luke Wilcox’s “Understanding and Visualizing Significance Level”. Do your students REALLY understand what they are saying when the write hypothesis test conclusions? Stop using flippant phrases like “If the P is low, reject the Ho”. and insist that your students write out specific language from day 1. Check out the many great ideas on the Statsmonkey page. Thanks to Adam Shrager and Jason for organizing the evening. Looking forward to next year already! 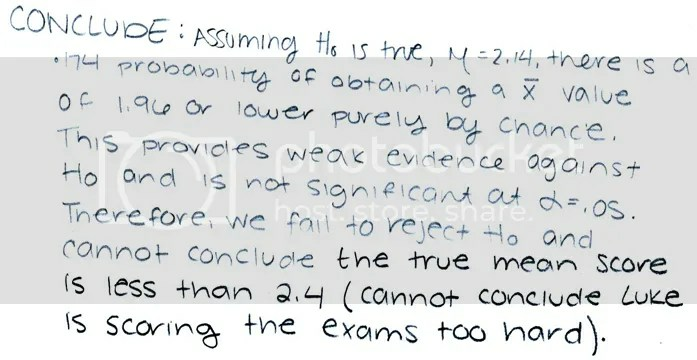 This entry was posted in Statistics and tagged ap reading, best practices. Bookmark the permalink.